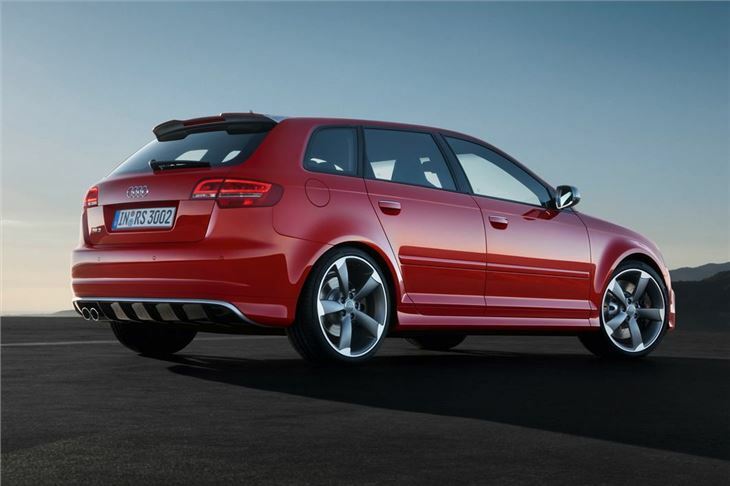 Audi has revealed its high performance RS3 Sportback - the top of the range model in the A3 line-up. And the big news is that it will use the turbocharged 2.5-litre TFSI engine with 340bhp that currently powers the TT RS, giving the the first ever compact hatchback RS model a 0-62mph time of just 4.6 seconds. Ordering for the newcomer opens in December 2010 and it's priced at £39,900 with the first deliveries expected in April 2011. The characterful five-cylinder engine provides 340bhp along with 450Nm of torque through a standard seven-speed S tronic twin-clutch transmission and quattro all-wheel-drive. A sound flap in the exhaust branch intensifies the sound even further when the driver presses the Sport button, which also varies throttle response. Maximum torque is readily available at the low end of the rev range, from around 1600rpm, and remains constant up to 5300rpm, promising excellent flexibility and response. It's also helped by weight-saving measures including the use of strong but light vermicular graphite for the engine block and carbon fibre-reinforced plastic for the front wings. These help to keep the kerb weight of the new RS3 down to 1575kg which also keeps the CO2 output down to 212g/km. 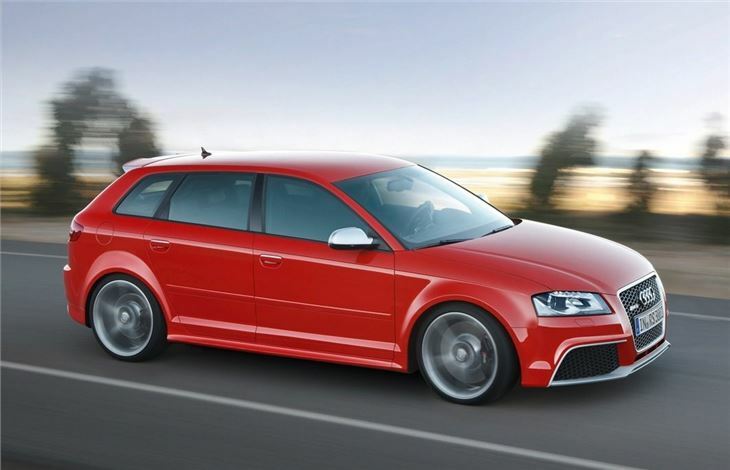 The extreme performance is gainfully employed by a chassis that lowers the RS3 Sportback by 25mm compared with the standard A3, and comprises McPherson struts upfront and a four-link rear set-up. Balance and composure are boosted by a widened, 1564 millimetre track and grip by 19-inch alloy wheels with 235/35 series tyres at the front and 225/35 at the rear. The standard wheel finish is a machine-polished titanium look, but a black finish with red rim inserts is also available as an option.The electronic stability programme (ESP) features a Sport mode that activates later intervention of the braking functions to enable greater adjustability without affecting safety. It can be switched off entirely for circuit use. 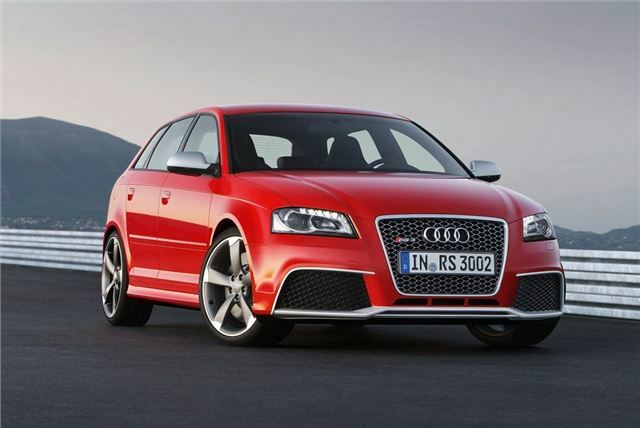 The RS 3 is marked out by a deeper front apron that incorporates enlarged air intakes, an anthracite coloured single-frame grille with diamond-patterned styling and xenon plus headlamps. There are also flared, lightweight front wings covering 19-inch alloy wheels, prominent sill panels, mirror casings in matt aluminium look and a large roof spoiler. A high-gloss black diffuser insert and two elliptical exhaust tailpipes on the left accentuate the styling at the rear. 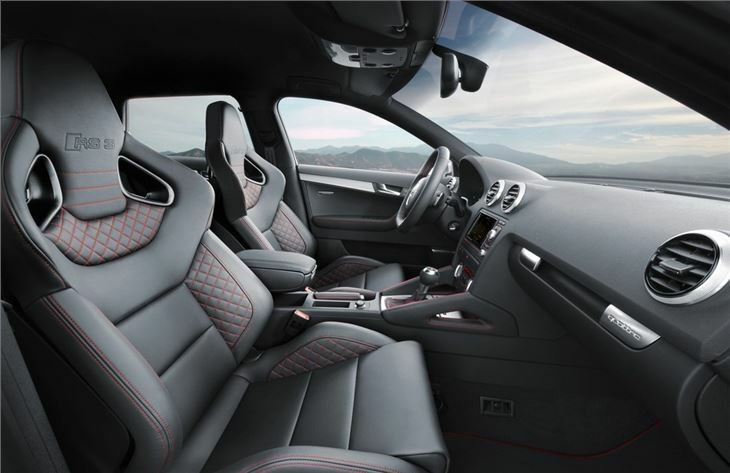 Inside, sports seats are upholstered in Fine Nappa leather with silver contrasting stitching, and inlays are finished in Piano black or the new Aluminium Race look. A flat-bottomed RS steering wheel and an exclusive design for the instruments and S tronic selector lever also highlight this car's status, as does a specially configured Driver's Information System which displays boost pressure and oil temperature and doubles as a lap timer. The array of standard equipment also includes the Sport button, acoustic rear parking sensors, electronic climate control, DVD-based satellite navigation with MMI (Multi Media Interface) functionality and xenon plus headlights with LED daytime running lights. Optional features include front bucket seats, roof rails in matt aluminium look and styling packages in black or matt aluminium. Five exterior colours are available, plus an unlimited selection of custom paint finishes.